The Corning Museum of Glass offers Artist-in-Residence programs at The Studio to encourage emerging artists working in glass. Throughout the year, these Artists-in-Residence lecture about their work at The Studio. Each lecture is free and open to the public. Mathieu Grodet is a French-born artist living and working in Canada. 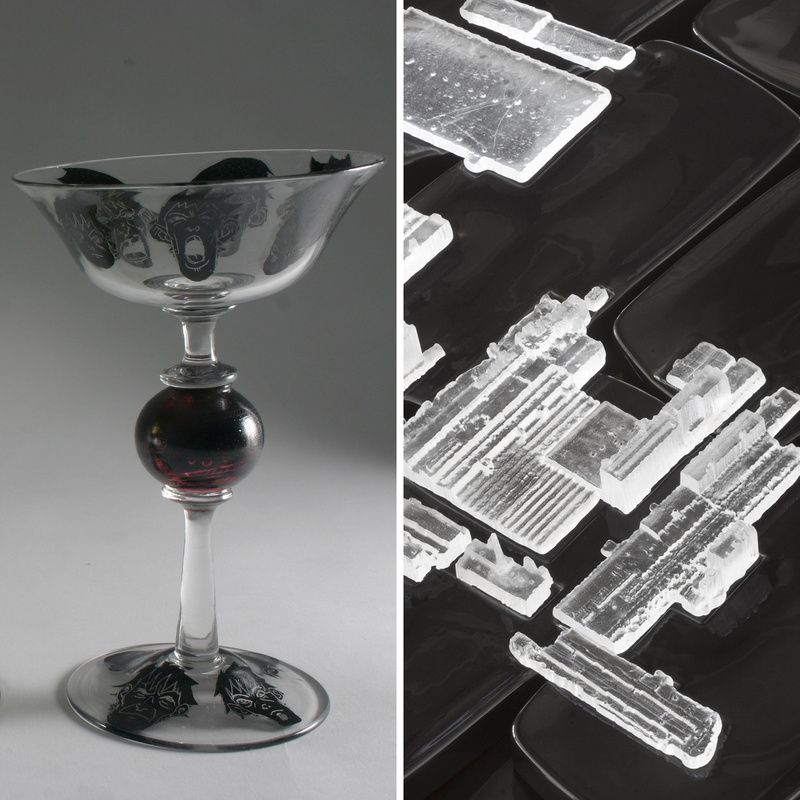 He creates thin and elegant glass objects in classic Venetian style, engraved with imagery that addresses modern-day ideas and issues. Says Grodet, “Several themes are recurrent: a work on the memory, the inventories, but also on the lie (propaganda) or the secret.” His work “reflects a deep interrogation on the world and its violence, and shows a large capacity for subversion.” Grodet is represented by Galerie Elena Lee in Montreal, Quebec. His art has been shown at SOFA Chicago, Galerie Espace Verre, and others, and is held in several museum collections, including The Corning Museum of Glass (2010.4.54 ) and the Art Institute of Chicago. He has taught and demonstrated around the world. In his March 2012 Residency at The Studio, Grodet will use the Museum’s Rakow Library to research forms and styles for vessels, as well as sketches for his final drawings on the vessels. Norwood Viviano uses digital 3D modeling and printing technology in combination with the casting process to create his sculptural works. Two recent bodies of works, Cities: Departure and Deviation and Kohler Pile, address power dynamics between industry and the surrounding communities that are dependent on it. Cities: Departure and Deviation, an installation comprised of 24 blown-glass forms, maps the relationship between industrial growth and decline relative to population expansion and contraction of major cities in the United States. In 2001, Viviano was the recipient of the Emerging Artist Award from the Glass Art Society. He has held residencies at several museums and art schools, and his work has been shown at galleries throughout the United States, including the Heller Gallery in New York City. His art is represented in the collections of the Museum of Decorative Arts in Prague; the John Michael Kohler Arts Center in Sheboygan, WI; and the Museum of Glass in Tacoma, WA; as well as private collections. In his March 2012 Residency at The Studio, Viviano plans to create urban and/or industrial landscapes out of kiln-cast glass as an extension of his previous installations. His work will “focus on smaller Midwestern industrialized cities that witnessed a huge population exodus during the second half of the 20th century, and West Coast and Southern cities that went through a transition of population growth, loss, and re-growth during the same period.